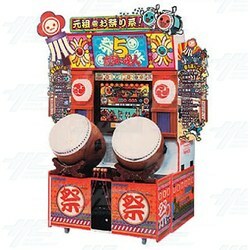 Taiko no Tatsujin 5 Arcade Machine is the fifth edition of the music and rhythm game series, released in 2003. The game is for 1-2 players and consists of two big taiko drums and a large screen. Each player has its own drum and two drum sticks, however the game can also be played as a one player game where you use one or both of the drums. The game is a 1 on 1, versus style music game, and each game consists of three rounds or songs. Each song has it's own difficulty, and both players can choose their own difficulty level when in versus mode. How to Play: Players must use their drumsticks to hit the drum as indicated on screen; the drum has two parts, the main section of the drum and the outer rim of the drum. On the screen you will see symbols moving across the screen and when they go past the left handside of the screen you hit the drum in the way that corresponds to the symbol. Small red faces means hit the centre of the drum once; the small blue face means hit the outer rim of the drum once; and a large red or blue face means to hit the appropriate section with both sticks. The drum strikes will go in rhymthm to the song you’ve chosen. Most of the songs have complete difficulty sets by this stage (i.e. can be selected from Kantan all the way up to Donderful), with the only exception being songs created specially for Taiko. These songs just had a Futsuu difficulty added to every one of them, and cannot be selected on Kantan. The new feature in Taiko 5 is the addition of a mode to pick a song before picking a difficulty, instead of the other way around. However, if you choose to pick songs before difficulties on Taiko 5, you will not be able to play on Donderful mode. Taiko no Tatsujin 5 has a total of 54 songs, 34 of which are new to the series. The main genre in this edition is J-Pop, although the game still features some anime and original track songs. The game is for 1-2 players and consists of two big taiko drums and a large screen. Each player has its own drum and two drum sticks, however the game can also be played as a one player game where you use one or both of the drums. The game is a 1 on 1, versus style music game, and each game consists of three rounds or songs. Each song has it's own difficulty, and both players can choose their own difficulty level when in versus mode. How to Play: Players must use their drumsticks to hit the drum as indicated on screen; the drum has two parts, the main section of the drum and the outer rim of the drum. On the screen you will see symbols moving across the screen and when they go past the left handside of the screen you hit the drum in the way that corresponds to the symbol. Small red faces means hit the centre of the drum once; the small blue face means hit the outer rim of the drum once; and a large red or blue face means to hit the appropriate section with both sticks. The drum strikes will go in rhymthm to the song you’ve chosen. Most of the songs have complete difficulty sets by this stage (i.e. can be selected from Kantan all the way up to Donderful), with the only exception being songs created specially for Taiko. These songs just had a Futsuu difficulty added to every one of them, and cannot be selected on Kantan. The new feature in Taiko 5 is the addition of a mode to pick a song before picking a difficulty, instead of the other way around. However, if you choose to pick songs before difficulties on Taiko 5, you will not be able to play on Donderful mode. Taiko no Tatsujin 5 has a total of 54 songs, 34 of which are new to the series. The main genre in this edition is J-Pop, although the game still features some anime and original track songs.